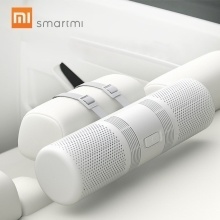 The Smartmi Car Air Purifier adopts a high-quality DC brushless motor with a twin-turbo fan, CADR of a value up to 70m³/h for about 2700 square centimeters filtration(single EPA filter), powerful filtration up to PM0.3 reaching up 99.68%, to make your car quickly circulated and filtered, Dual-turbine fan with a dual-filter structure design for greatly improving the filtration efficiency, good Air Purifier for refreshing your car air. * CADR of a value up to 70m³/h，to make your car quickly circulated and filtered. * Powered by a high-quality DC brushless motor with a twin-turbo fan. * Unique 360° air inlet design, built-in dual EPA12 filter, and powerful filtration up to PM0.3. * Dual-turbine fan with a dual-filter structure design for greatly improving the filtration efficiency. * 4.5m long power cord with a cigarette lighter plug, a USB port on top, conveniently charging for other devices. * Expanded area of a single EPA filter element is about 2700 square centimeters, and the filtration efficiency of particles as small as 0.3 micron reaches to 99.68%.